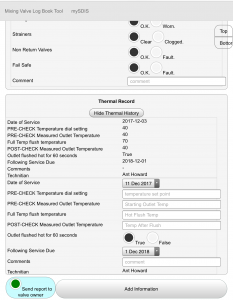 Yimelo’s mixing valve management tool provides the ultimate convenience for the management and recording of your obligations for Thermal Mixing Valve management. 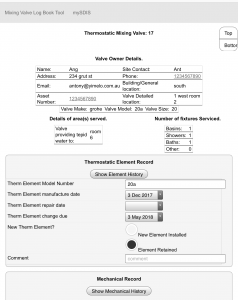 As with all our products it is cross platform, easy to use and intuitive which allows service providers to get on with the job, or facility managers to easily keep track of their valves through a detailed valve history. 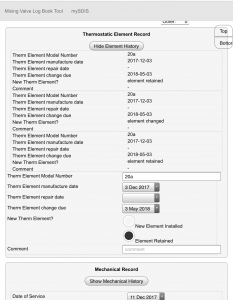 Yimelo’s logbook software publishes a PDF to stakeholders whilst maintaining a comprehensive database history so that record integrity is maintained through all stages of the management cycle. 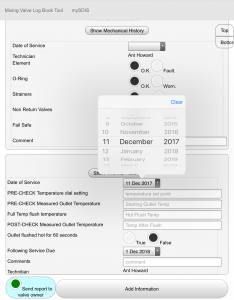 Our product is geared toward both service providers (such as plumbers) who have multiple clients and to manage facility managers, who may wish to have a single organisational structure. 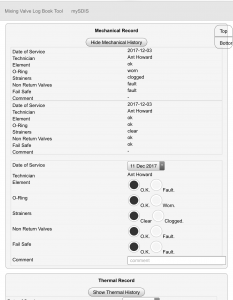 Importantly, Yimelo’s mixing valve tool allows for the invitation of stakeholders & clients to view valves managed on their behalf through our viewer portal (conditions apply). This gives customers an excellent reason to provide return business. To find out more, or arrange a demonstration why not get in touch via our contact page.